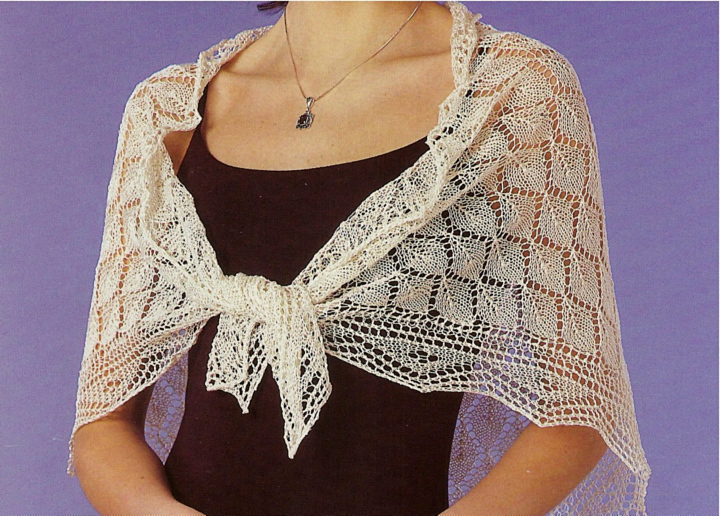 Knit a light, airy and romantic wrap! The simple repetition of the diamond lace stitch pattern knits up fast and pleasantly. The body of this shawl is knitted from bottom point and increases are made regularly at each side to the finished width at the neckline. The border is then knitted, not sewn, directly onto the side edges and mitered at the point. Width and length are at the discretion of the knitter. Kit includes pattern and a generous supply of Tri-Finca perle cotton (100% long-staple cotton, 3-ply), the perfect alternative to lace-weight wool. Color: Ecru.